Global views of the U.S. and its president have shifted dramatically downward since the end of Barack Obama’s presidency and the start of Donald Trump’s, and they are now at similar levels to ratings from the George W. Bush era, according to a new Pew Research Center report that examines attitudes in 37 countries. Build your own charts to see U.S. favorability and confidence in the U.S. president from 2002 to 2017. 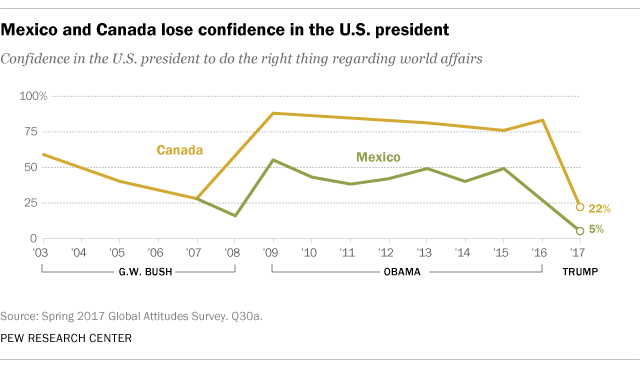 1Mexico and Canada have lost confidence in the U.S. president. In the United States’ southern and northern neighbors, confidence has fluctuated over the past three presidencies but declined most sharply this year. Just 22% of Canadians and 5% of Mexicans have at least some confidence in the U.S. president, down from more than eight-in-ten Canadians (83%) in 2016 and half of Mexicans (49%) in 2015. While Canadians generally have indicated greater confidence in U.S. presidents than Mexicans have, current Trump confidence levels are lower than both countries’ Bush-era lows. These countries have generally maintained fairly steady levels of U.S. favorability over the past 15 years, yet they both show a sharp drop in U.S. favorability since Trump took office. Three-in-ten Mexicans have a very or somewhat favorable view of the U.S., down from two-thirds (66%) in 2015. About four-in-ten Canadians have favorable views of the U.S. (43%), down from 68% in 2015. Current Trump confidence ratings in these countries are similar to their respective lows during the George W. Bush years. For example, only 13% of French respondents had at least some confidence in Bush in 2008, and now 14% in France say the same for Trump. Likewise, 14% of Germans had at least some confidence in Bush in 2008, while 11% are confident in Trump now. 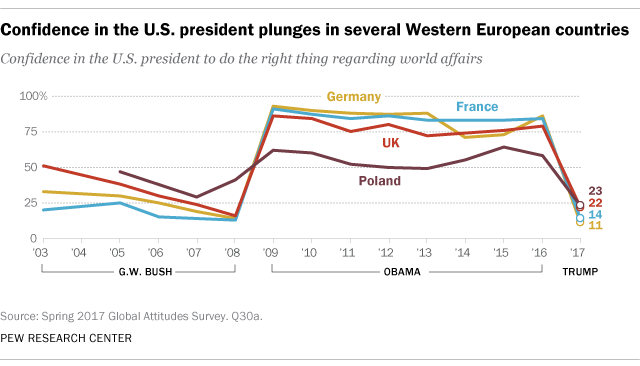 In Europe, Poland is a bit of an outlier, since its confidence in the U.S. president changed less dramatically across the three administrations. Polish respondents had a Bush-era high of 47% confidence and an Obama-era high of 64%, yet just 23% of Poles have confidence in Trump in 2017. When it comes to U.S. favorability, Poland has remained relatively positive and stable since 2002. France and Germany, on the other hand, show greater fluctuation across administrations, with higher overall U.S. favorability during Obama’s presidency. 3Russia and Israel have gained confidence in the U.S. president. Since Obama’s final term, confidence has gone up among Russians and Israelis. 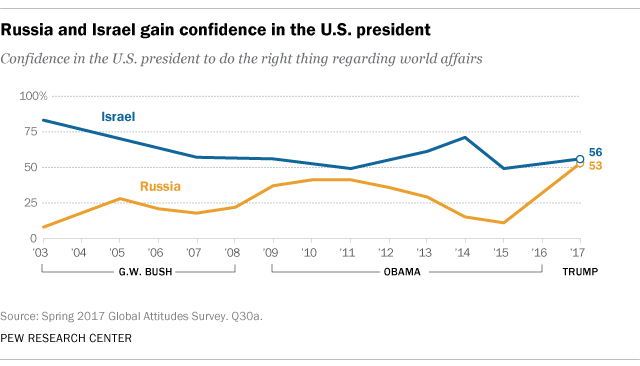 This year, 53% of Russians have at least some confidence in the U.S. president, up from an Obama-era low of 11% in 2015. Russian confidence in Obama rose and fell over the president’s eight years in office, which saw tensions with Russia over Ukraine and other issues. In Israel, 56% are confident in President Trump, up from 49% confidence for Obama in 2015. Over the past 15 years, Israeli confidence in the U.S. president was highest in 2003, when 83% said they had at least some confidence in George W. Bush. While more than half from both countries have confidence in Trump, Russia and Israel differ in overall U.S. favorability. Israel has shown consistently favorable views of the U.S. over the past 15 years (81% in 2017). 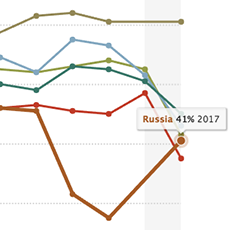 Russia’s favorability of the U.S. has fluctuated more, but is up to 41% with Trump in office after hitting a low of 15% two years earlier. 4Countries in the Middle East continue to have low favorability ratings for the U.S. Just 15% in Jordan and 18% in Turkey have at least a somewhat favorable view of the U.S. in 2017. While U.S. favorability in Jordan has remained relatively constant for the past six years, favorability in Turkey is down almost 10 percentage points from 2015 (when 29% expressed favorable views). U.S. favorability is consistently higher in Lebanon, reaching 55% in 2009, but has slowly declined to 34% in 2017. Lebanon, Turkey and Jordan consistently have had low confidence in the U.S. president, regardless of who that was, over the past 15 years. Today, just 15% in Lebanon, 11% in Turkey and 9% in Jordan have confidence in Trump. 5Japan and South Korea have sharply lower confidence in the U.S. president, but majorities remain favorable toward U.S. overall. Only around a quarter of Japanese respondents (24%) and 17% of South Koreans say they are confident in the U.S. president now that Trump is in office. That represents a 71-percentage-point drop in South Korea from 2015. And confidence among Japanese dropped 54 points between 2016 and 2017. Despite this plunge in attitudes toward the U.S. president, overall U.S. favorability remains high in both countries. Three-quarters of South Koreans have a favorable view of the U.S. while 57% of people in Japan say the same. 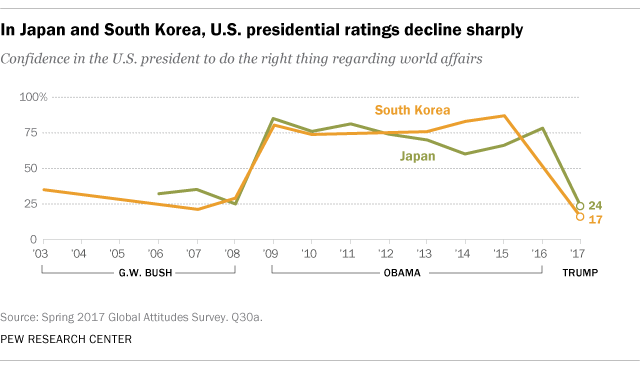 U.S. favorability gradually climbed among South Koreans since 2002, with a 9-point drop this year compared with 2015. In Japan, on the other hand, favorability declined during the Bush years, peaked in 2011 at 85% and fell to 57% in 2017. Use this interactive to explore global opinions of the United States and confidence in its president since 2002.